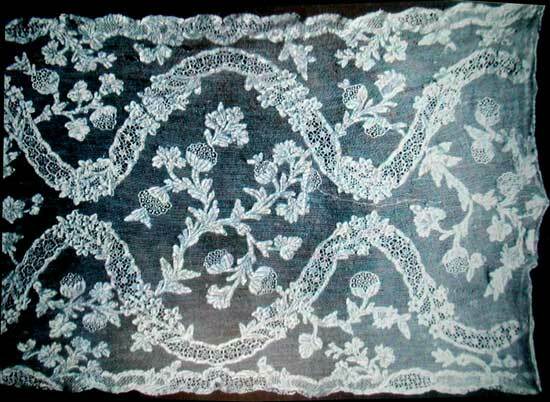 In the Island of Burano a considerable quantity of Venetian point lace was manufactured during the eighteenth century. The ground was the reseau, not the bride variety, so that, in this particular, the lace resem­bled Alencon and Brussels. The thread used was ex­tremely fine and delicate. Until 1845 the art of lace-making lingered on in the nunneries, but little was made elsewhere. During recent years a revival has taken place, and the Burano lace of the present day is in no way inferior to the old fabric, while laces identical with the finest Venetian, Rose Point, Point de Gaze, Alencon, and Argentan are produced, which rival in beauty such laces made in the best years of their native manufacture. Scarfe in Burano point, 18th c.
Only the choicest and most beautiful kinds of lace were made at Burano in the early 20th century; they include Point de Venise, Tagliato a fogliami, Point de Venise a la rose, Point d'Argentan, Point d'Alencon, Point de Bruxelles, and Point d'Angleterre.